I don’t know about you, but there are quite a few people in the toucanBox office who have left it very late to buy their Christmas presents this year (and every year…). If you’ve got some last-minute Christmas presents to buy and you don’t fancy facing the shops then we’ve got the perfect solution with our homemade Christmas crafts. These crafts look smart enough to be given as lovely gifts and they’re not too tricky so your children can get crafting, too. Get creative this festive season and give homemade crafts with a personal touch that everyone will love. Chocolate and mint is a match made in heaven and our peppermint bark is no exception. Snap into shards and present in a jar or wrap in cellophane. Finish off this delicious gift with a red ribbon for a festive touch. 1 Melt dark chocolate in a bowl over a pan of boiling water. 2 Line the baking tray with the aluminium foil and grease the foil with the butter. Pour the melted chocolate onto the baking tray. 3 Add a few drops of peppermint oil to the dark chocolate layer and swirl. 4 Pop the baking tray in the fridge for about 15 minutes, or until the chocolate has set. 5 Meanwhile, smash the candy canes into small pieces and melt the white chocolate. 6 Once the dark chocolate is hard, pour the white chocolate on top and press the smashed candy canes into the white chocolate. You need to work quickly to ensure that the dark chocolate doesn’t melt. 7 Pop the baking tray back into the fridge for five minutes. The white chocolate should have started to set but will not be fully hard. Score the chocolate with a knife. This will make it much easier to snap once it is set. Chill for another 15 minutes. 8 Once the white chocolate has set, remove from the fridge and snap into shards. 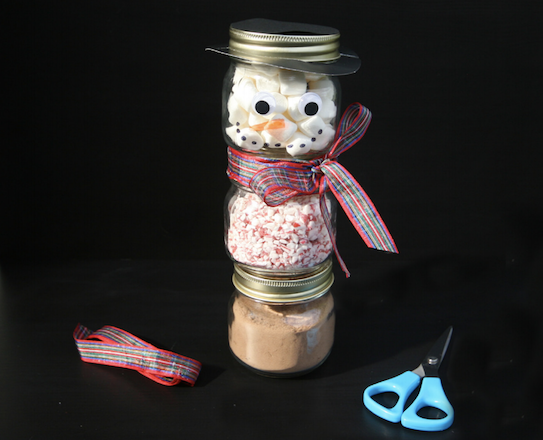 Wrap in cellophane or place in a jar and make someone’s Christmas delicious! Hot chocolate is the perfect drink to warm you on a cold winter’s day. This snowman gift set will delight any chocolate lover and, when the ingredients have been used up, it also makes a charming decoration. 1 Trace the lid from one jar onto the black paper. Draw a slightly larger circle around it. Cut out the larger circle. Fold in half and cut out the smaller circle. 2 Slide the black ring over the lid onto the jar. 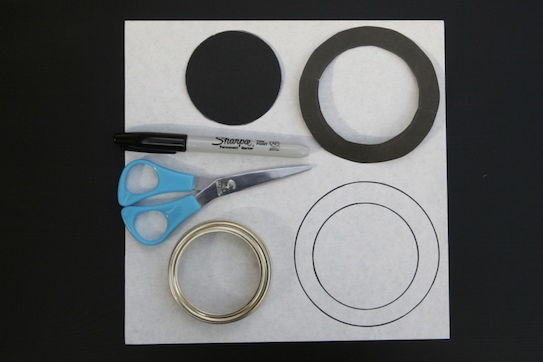 Glue or tape the black circle onto the top of lid. 3 Stick the googly eyes onto the jar. 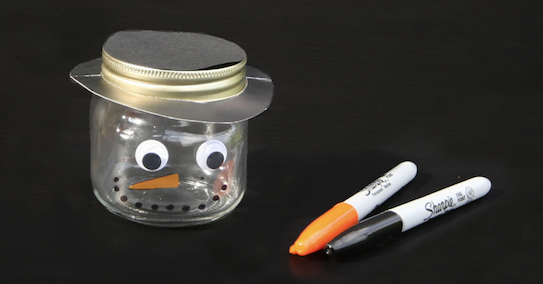 Draw a carrot nose and coal mouth on the jar. 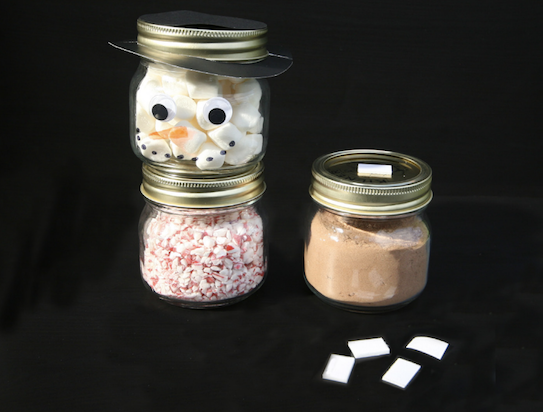 4 Fill the snowman face jar with marshmallows. 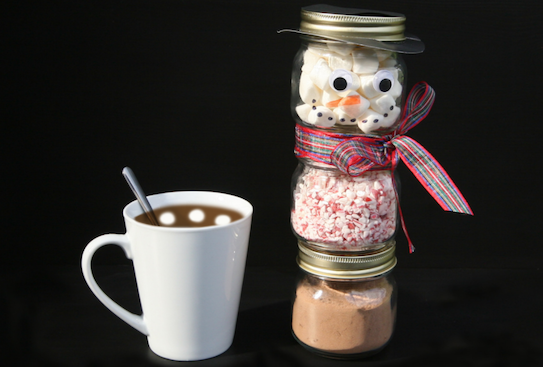 Fill the second jar with the peppermint candies or crushed candy canes. Fill the third jar with cocoa powder. 5 Stack the jars together using Velcro dots, glue dots, or double-sided tape to keep them secure and steady. 5 Tie a ribbon scarf between the first and second jar. Still short of a gift or two? We’ve got a few more craft ideas that will please even the most difficult to buy for. The perfect gift for someone who loves bird-watching in their garden. Dissolve two sachets of gelatine in boiling water and add your bird seed mix (you will need approximately the same amount of water as bird seed). On a foil covered tray, fill biscuit cutters with the bird seed mix. Make sure the mix is packed in tightly. Use a straw to make a small hole in the middle of the mixture so that ribbon can be threaded through to hang the bird feeder. Pop the bird feeders in the fridge for a few hours and then leave them to dry overnight. Thread the ribbon through the hole and your feeders are ready to hang in the garden. This is a great way to use up broken crayons. Wrap these along with a colouring book for an affordable gift this festive season. Peel any paper off the broken crayons. Place the broken crayons in a silicone baking mould or ice tray. The shape is up to you – we think that gingerbread people and heart moulds make very cute crayons. Place the mould into the oven on a low heat to melt the crayons. It should take about 15-25 minutes, but make sure you check regularly and remove the mould as soon as all of the gaps are filled. Wait until the crayons have hardened completely before popping them out of the mould. Everyone loves a variety tin of biscuits at Christmas. Make a special homemade version by baking a few different types of biscuits and filling an empty biscuit tin with them. Use cupcake cases to separate the different biscuit varieties. Make this gift personal by baking the recipient’s favourite biscuit flavours. Not tried out a toucanBox yet?